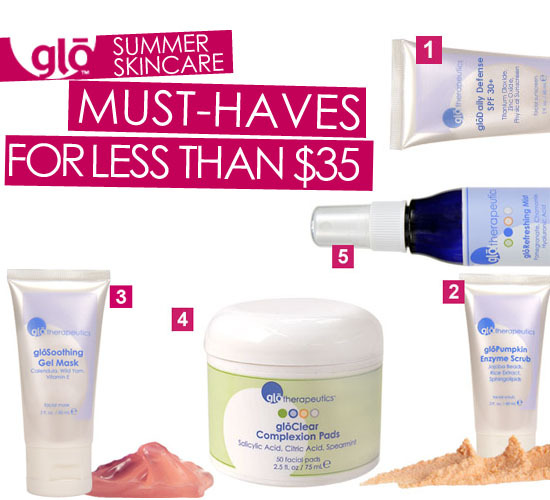 Now that summer's officially arrived, be sure to keep your skin looking its glo-ing best with our top summer glotherapeutics picks -- all under $35! A lightly tinted broad spectrum protector that easily applies daily and has a smooth finish. Keep your complexion fresh and radiant by exfoliating several times a week with this luxurious scrub. In case you accidentally get too much sun, vitamin E and antioxidants work to heal and soothe. Easy application pads contain active ingredients to gently break down excess sebum, immediately balance oily skin and help prevent growth of p.acne bacteria. Keep your cool while lounging poolside or stash in fridge for an extra refreshing mist.